Fancy feast your eyes on Bulgaria’s beautiful green alien cat, an eye-catching stray kitteh whose magical, jewel-toned fur coat has been luring tourists to the quaint seaside town of Varna since 2014. That year, locals noticed the fashion-forward feline strutting her stuff on the streets with a less colorful, but equally cute, cat companion. 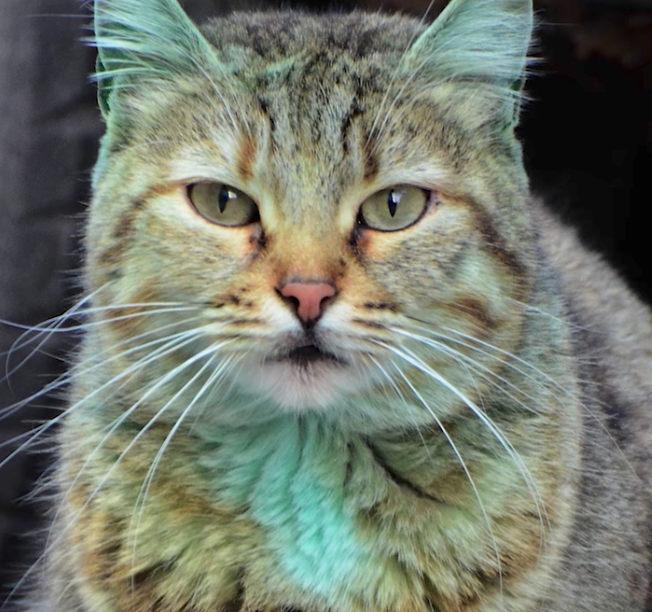 At first, Varna residents worried the kitty may have been painted green as part of a cruel prank. But as luck would have it, concerned locals learned the purrfectly pigmented fur ball turned herself green, repeatedly curling up for a catnap in an old paint barrel. Given the kitteh’s overall good health and her coat’s consistent coloring, the cat lovers concluded the kitty dyed herself with some sort of non-toxic food or textile dye leaking from the barrel. After it was determined their furry friend’s life was not in danger, townspeople and tourists celebrated the kitty’s unique cat-eristic, offering her treats in exchange for a quick peek at her curious coat. Today, with the help of a few animal advocates and a new favorite sleeping spot, Varna’s kitty chameleon has changed up her look, returning to her natural color save a few bright green highlights around her ears, eyes, and chest. While her new ‘do may not scream, “Look at me meow…er, now!”, we still think this kitteh’s the cat’s pajamas.